Mamma Mia! is coming to Sri Lanka very first time in South Asia. Buy tickets and music festival information. 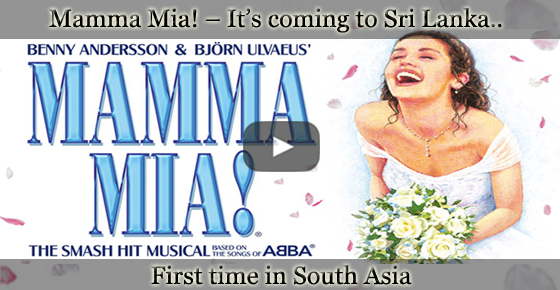 Cinnamon Life will present Benny Anderson and Bjorn Ulvaeus' famous Broadway musical - MAMMA MIA! for the first time in South Asia. This international tour is presented by Judy Craymer, Richard East and Björn Ulvaeus for Littlestar in association with Universal, Stage Entertainment and NGM. The production includes hit songs from Swedish pop and ABBA dance group. "Mamma Mia!" Has been performed in more than 50 countries on 6 continents and translated into 26 different languages. More than 60 million people have seen the show around the world and it has set the record for creation in more cities than any other musical in history. Mamma Mia is an iconic musical composed exclusively of Abba songs. This musical masterpiece was staged for the first time on April 6, 1999 in the West End at Prince Edward Theater. He was then transferred to the Prince of Wales Theater on June 9, 2004, where he played until September 2012 before moving to the Novello Theater. MAMMA MIA! is the ultimate show of wellbeing that combines the magic of narrative, humor and timeless music to deliver an enchanting story of love, laughter and friendship that will ensure you have a good time.